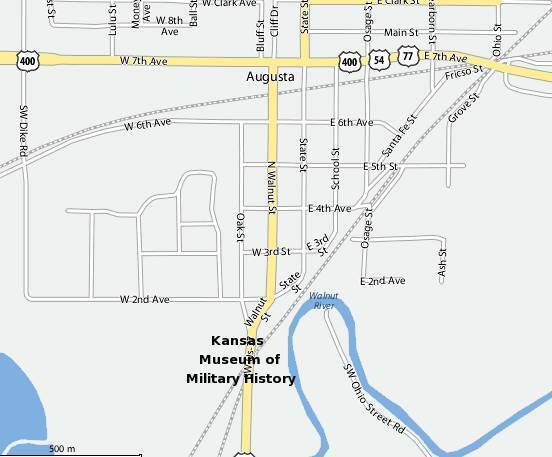 Augusta Air Museum in Augusta, Kansas changed its name to the Kansas Museum of Military History several years ago. Changing the name of the Air Museum maked sense - only a small part of the museum's collection is related to aviation, there is much more about all branches of the military. The Augusta Air Museum began in 1990 as Detachment 1 of Topeka's Combat Air Museum. The Augusta Air Museum separated from the parent museum in Topeka, Kansas in 2002. The Air Museum moved into its current large facility in Augusta, Kansas in 1994. The Kansas Museum of Military History is home to over 10,000 articles, including planes, tanks, trucks, jeeps and helicopters. The museum has over 30 military uniforms on display and over 200 uniforms in storage. Exhibits describe the contributions of Kansas to the United States military from the Civil and Indian Wars through the current wars in the Middle East. One of the things that I found most interesting was the story of a Seahorse air rescue boat which the community of Augusta purchased by selling $75,000 in war bonds in 1943. Supposedly this was the first time a community bought a ship for the Unites States Navy. The boat rescued over 40 aviators. Two members of the crew received silver stars, and the rest received bronze. One tenth scale drawing of the Seahorse, World War 2 air-sea rescue boat. Jerry Blair, founder of the Kansas Museum of Military History, painting the museum's new logo.